Choice Solutions Ltd. handles complex DC projects under the methodology followed which is Assess-Design-Deploy-Train- Manage-Audit. Choice Solutions after studying the physical location of DC area, premises, the floor above and below, the DC floor, the power availability for total premises, the availability of alternative backup, etc. prepares an assessment report. Based on the assessment feedback the IT and FM designing consultants Choice Solutions start engaging with customers IT and facilities teams to get the required inputs from the client in terms of the number of internal and external users, total number of offices to connect, application to host, and databases to manage, etc. As the above inputs are fed to the data center design consultants, Choice Solutions arrives at the total power required, the required KW from the state electricity board, placement of transformers, alternative backup power required and the HVACs requirement for the total facility. All this helps to prepare a high rated data center for the clients. 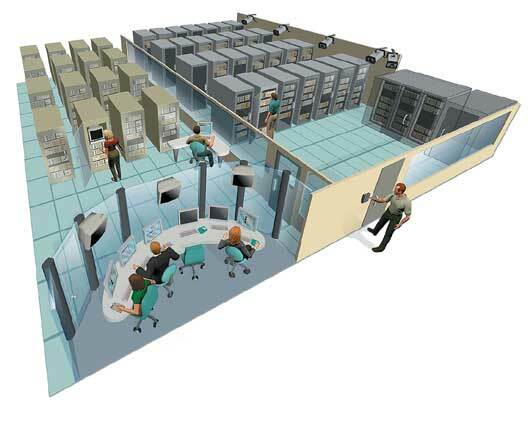 Any data center project begins with a detailed assessment of the business and Facility requirements. Let our consultants and certified experts at Choice Solutions assist you with defining the “as is” and “to be” states of IT and Facilities aspects of the data center based on evolving business requirements. This includes a thorough evaluation of the planned location and site for the data center. It further includes pinpointing the Tier of the data center. The design of a data center has a long-term impact on costs and its ability to meet user needs in almost real-time. It must be modular, so that it is easy to add more of the same components in case of future needs. It is just as important to know which components must be sized for final-day requirements as increasing their size requires unjustifiable expenses. The design must be at par with international standards and confirm to minimum regulatory requirements. If designing a data center is not a revenue-generating line of business for you, leave it to those who make a living out of it. Call Choice Solutions to review various data center design options with prices and select a design that meets your demands, has high availability, and is also scalable. Data center deployment is a detailed, full time, and stressful job. The use of large number of complex systems makes the undertaking a real challenge. A staggering number of details that can make or break the project must be given proper attention. What happens is that, most companies lack the required manpower to carry out the deployment themselves. This is where Choice Solutions comes in. We can help our clients install data centers utilizing our Data center Building services and best-of-the-breed Physical Data center, Software, and IT Hardware service offerings. Good data center managers are difficult to hire and tougher to retain. A cost-effective solution is to hire someone who can meet the DC administrative needs. As user requirements grow, so does the need to hire more administrators. Due to the complexity of managing data centers, users cannot afford to let data center managers learn from the school of hard knocks. A business-critical data center is not a sandbox and mistakes cannot be made. Not even for the first time. It is therefore imperative, to have them trained right at the first time itself.Choice Solutions offer to its users include building customized training modules for their data center, and IT needs, and deliver the class or session at user site or at its own offices. We have domain experts in almost all data center and IT areas. They work with users to build and deliver technical sessions suitable for the kind of team skills users need. The data center is the nerve center of every organization, as such its uptime and high availability are critical to smooth operations and overall company mission. We at Choice Solutions provide ITIL-based IT Infrastructure Management services for high availability of the IT infrastructure, customized to customer specific Quality of Service (QoS) needs. In addition to this, we also provide Physical Infrastructure Maintenance services to ensure high availability on the facility side. · Data center and Facility Power and Cooling Audits. · IT Infrastructure and Network Assessment Services. · Network Security and Penetration Assessment. · Server Performance and Security Audit. Since its inception Choice Solutions Limited has been regularly providing supply and after sales service to its UPS customers.